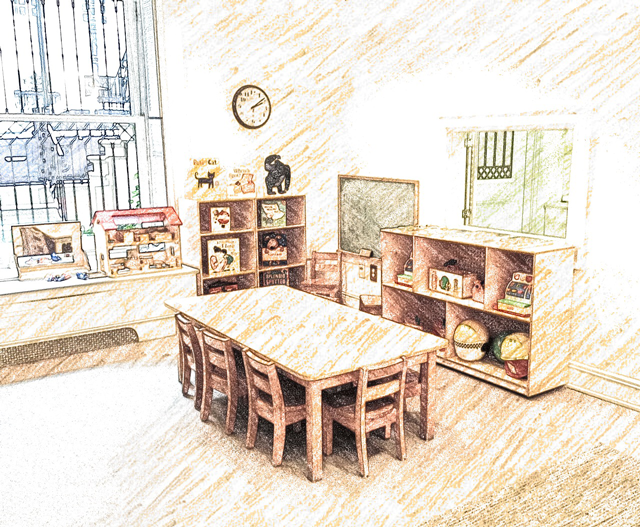 Pre-Nursery Programs provide a transition from toddler playgroup to nursery school. Children play twice a week in a nursery school-like setting which has an adjoining Mothers' Room. While mothers provide a secure base, trained Play Group leaders facilitate play and socialization. A variety of opportunities for independent and group play, child-initiated and adult-directed play activities are provided. Turn-taking and cooperative play are supported. Children are empowered to communicate their likes and dislikes effectively. Children learn Pre-Nursery routines gradually and increasingly participate eagerly. Throughout this process, touching base with their mothers promotes their play, socialization and learning. Parent Conferences are scheduled with Play Group leaders throughout the year to collaborate with parents in order to enhance the Pre-Nursery experience. Play materials and activities include: manipulative toys, art, water, sand, music, pretend play, construction toys, story and snack-time. The Mothers' Discussion Group meets weekly while the children play. Mothers discuss child development and parenting, and at the same time provide additional support to their children who benefit from sharing moments of pleasure or frustration. Discussion topics include: sleeping and eating, separation, language acquisition, toilet training, peer interactions, limit setting, and sibling relationships.